This chapter addresses the policy shifts on autism in Brazil and USA in the last decades, stressing the common points and differences between both countries in the fields of public mental health, disability rights movements, and education. The chapter starts with a historical overview of institutionalization and deinstitutionalization processes in these countries, and then describes the tensions among different mental health, educational, and disability studies approaches to autism in both places. In Brazil, this tension involves family associations and the disability sector, in conflict with mental health professionals, psychoanalysis, and Basaglian psychiatry. In the USA, alongside family advocacy and disability rights associations, there are emerging autistic self-advocacy and peer-support groups that often find themselves in conflict with a biomedical mainstream focused on prevention and cure. Each country has something to learn from the other, as both continue to face the challenge of building a more inclusive approach for autistic people. Autism Speaks. n.d. “Applied Behavior Analysis (ABA).” https://www.autismspeaks.org/what-autism/treatment/applied-behavior-analysis-aba. Accessed January 20, 2017. Autistic Self Advocacy Network. n.d. “Position Statements.” http://autisticadvocacy.org/home/about-asan/position-statements/. Accessed February 24, 2017. Brasil, Ministério da Saúde. 2002. “III Conferência Nacional de Saúde Mental—Cuidar sim, excluir não. Relatório Final.” http://conselho.saude.gov.br/biblioteca/Relatorios/saude_mental.pdf. Accessed January 24, 2017. Brasil, Ministério da Saúde. 2004. “Saúde Mental no SUS: Os Centros de Atenção Psicossocial.” http://www.ccs.saude.gov.br/saude_mental/pdf/SM_Sus.pdf. Accessed February 8, 2017. Brasil. 2012a. “Portaria n.o 793, de 24 de abril de 2012. Institui a Rede de Cuidados à Pessoa com Deficiência no âmbito do Sistema Único de Saúde.” http://bvsms.saude.gov.br/bvs/saudelegis/gm/2012/prt0793_24_04_2012.html. Accessed January 28, 2017. Brasil. 2012b. “Lei n.o 12.764, de 27 de Dezembro de 2012. Institui a Política Nacional de Proteção dos Direitos da Pessoa com Transtorno do Espectro Autista.” http://www.planalto.gov.br/ccivil_03/_ato2011-2014/2012/lei/l12764.htm. Accessed January 19, 2017. Brasil, Ministério da Saúde. 2013a. “Diretrizes de Atenção à Reabilitação da Pessoa com Transtornos do Espectro do Autismo (TEA).” http://bvsms.saude.gov.br/bvs/publicacoes/diretrizes_atencao_reabilitacao_pessoa_autismo.pdf. Accessed January 19, 2017. Brasil, Ministério da Saúde. 2013b. “Linha de Cuidado para a Atenção às Pessoas com Transtornos do Espectro do Autismo e suas Famílias na Rede de Atenção Psicossocial do Sistema Único de Saúde.” http://bvsms.saude.gov.br/bvs/publicacoes/linha_cuidado_atencao_pessoas_transtorno.pdf. Accessed January 19, 2017. Brasil, Ministério da Saúde. 2015. “Saúde mental em dados 12.” Electronic Newsletter, year 10, nº 12. Informativo eletrônico. http://www.mhinnovation.net/sites/default/files/downloads/innovation/reports/Report_12-edicao-do-Saude-Mental-em-Dados.pdf. Accessed January 19, 2017. Caffeinated Autistic. 2013. “The Good, Bad, and the Ugly: My Assessment of Our Experience with Applied Behavior Analysis (ABA).” https://thecaffeinatedautistic.wordpress.com/2013/01/17/the-good-bad-and-the-ugly-my-assessment-of-our-experience-with-applied-behavior-analysis-aba/. Accessed August 16, 2016. Couto, Maria Cristina Ventura, and Pedro Gabriel Godinho Delgado. 2015. “Crianças e adolescentes na agenda política da saúde mental brasileira: inclusão tardia, desafios atuais.” Psicologia Clínica 27 (1): 17–40. http://www.psi.puc-rio.br/site/images/psi_puc/publicacoes/Psicologia_Clinica_27-1.pdf. Food and Drug Administration, Office of Criminal Investigations. 2015. “May 28, 2015: Seller of ‘Miracle Mineral Solution’ Convicted for Marketing Toxic Chemical as Miracle Cure.” https://www.fda.gov/iceci/criminalinvestigations/ucm448541.htm. Accessed August 16, 2016. Grace, E.J. (Ibby). 2013. “Are You Neuroqueer?” http://neuroqueer.blogspot.ca/2013/09/are-you-neuroqueer.html. Accessed August 17, 2016. Jones, Sparrow Rose. 2014. “ABA.” Unstrange Mind. http://unstrangemind.com/?s=aba. Accessed October 23, 2017. Kras, J.F. 2010. “The ‘Ransom Notes’ Affair: When the Neurodiversity Movement Came of Age.” Disability Studies Quarterly 30 (1). http://dsq-sds.org/article/view/1065/1254. Accessed July 8, 2015. Mello, Ana Maria, Helena Ho, Inês Dias, and Meca Andrade. 2013. “Retratos do autismo Brasil. Secretaria de Direitos Humanos da Presidência da República (SDH/PR).” https://www.autismo.org.br/site/images/Downloads/RetratoDoAutismo-20131001.pdf. National Institutes of Health. 2017. “National Institute of Mental Health: Important Events in NIMH History.” https://www.nih.gov/about-nih/what-we-do/nih-almanac/national-institute-mental-health-nimh. Accessed October 31, 2017. National Institute of Mental Health. n.d. “About NIMH.” https://www.nimh.nih.gov/about/index.shtml. Accessed October 31, 2017. Robertson, Scott Michael. 2010. “Neurodiversity, Quality of Life, and Autistic Adults: Shifting Research and Professional Focuses onto Real-Life Challenges.” Disability Studies Quarterly 30 (1). http://www.dsq-sds.org/article/view/1069/1234. Sinclair, Jim. 2005. 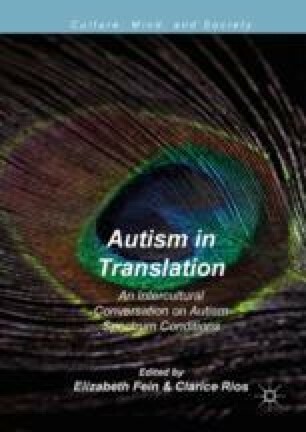 “Autism Network International: The Development of a Community and Its Culture.” http://www.autreat.com/History_of_ANI.html. Accessed November 13, 2017. Tsouderos, Trine. 2009. “‘Miracle Drug’ Called Junk Science.” Chicago Tribune, May 21. http://www.chicagotribune.com/lifestyles/health/chi-autism-lupron-may21-story.html. Wakefield, A.J., S.H. Murch, A. Anthony, J. Linnell, D.M. Casson, M. Malik, M. Berelowitz, A.P. Dhillon, M.A. Thomson, P. Harvey, A. Valentine, S.E. Davies, and J.A. Walker-Smith. 1998. “Ileal-Lymphoid-Nodular Hyperplasia, Non-specific Colitis, and Pervasive Developmental Disorder in Children.” The Lancet 351 (9103): 637–641. https://doi.org/10.1016/s0140-6736(97)11096-0. PMID 9500320 (Retracted). Walker, Nick. 2014. “Neurodiversity: Some Basic Terms & Definitions.” Neurocosmopolitanism. http://neurocosmopolitanism.com/neurodiversity-some-basic-terms-definitions/. Accessed August 11, 2016. Whitt, Tracy Dee. 2014. “My Thoughts on Applied Behavior Analysis (ABA)—Autism.” Lovin’ Adoptin’ Supporting Adoptive Parents and Families Living with Autism. http://lovinadoptin.com/2014/03/26/my-thoughts-on-applied-behavior-analysis-aba-autism/. Accessed July 22, 2015. Wright, Suzanne. 2013. “Autism Speaks to Washington: A Call for Action.” Originally posted at https://www.autismspeaks.org/news/news-item/autism-speaks-washington-call-action. Accessed February 24, 2017, now accessible at https://unv.is/autismspeaks.org/news/news-item/autism-speaks-washington-call-action. Accessed October 31, 2017.